It is a sad state to witness the failing mental and physical capabilities of your loved ones, more so, as you recall the blissful days under their care. All of a sudden you are pushed into a role where their well-being and safety takes precedence over your other priorities shaking you emotionally and financially. Whether you are prepared or not, making impactful decisions on how to manage their wellbeing will become vital. Studies have shown that within the next 30 years, the number of people crossing 65 years of age and above is set to more than double, reaching almost 2 billion. In other words, while current and future generations decrease in size, they would need to be prepared to care for a larger generation of elderly loved ones in need. Against this backdrop of an aging scenario, technology is making its mark in providing families peace of mind in helping their elderly loved ones age gracefully. The Safety Senior App, a senior alert system, is one such technology empowering caretakers of the elderly while providing elders freedom and dignity to live their life independently and comfortably in the knowledge that they are being monitored remotely by their loved ones. 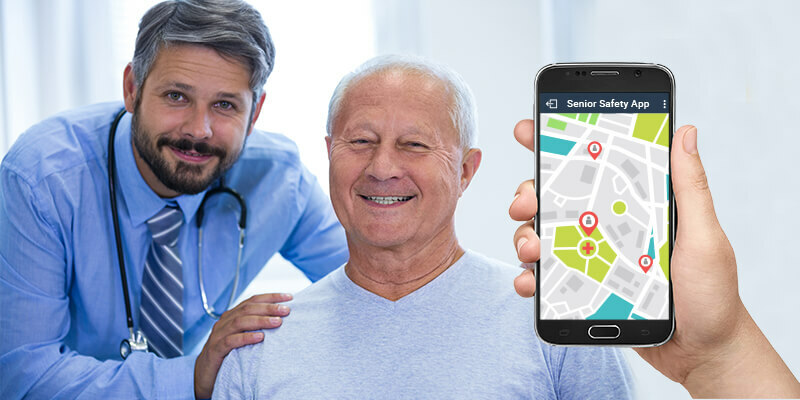 One compelling benefit of the Safety Senior App is that it allows you to monitor if your elderly loved one or parents are missing out on appointments with their physicians. It provides you with alerts whenever he or she enters or leaves specific geographical areas that are assigned to the app—such as the neighborhood. The app also traces visits to certain addresses, as well as their speed and routes. Such useful data has many applications, showing you whether your loved one is getting enough exercise and is visiting the doctor as he should be. By revealing a 90-day location history, the app provides an overall picture of your elderly’s physician’s visits. Free, unobtrusive, easy to use Senior Safety App is chock full of features—from GPS location monitoring to fall alert systems for seniors and inactivity notifications – befitting a tool designed to safeguard elders. The app uses GPS (or global positioning system) technology that is already built into modern smartphones, and then makes sense of the information it gathers. This is the same technology that is widely used in medical monitoring and senior alert systems for seniors these days. The pro version of the app is very affordable with all the features of a more expensive gadget including fall alert system for seniors, inactivity trackers, and many more. While the basic SOS features are free for life, the premium features are available for just $4.50 a month or $45.00 a year. And should you be unsatisfied with the service for some reason you can simply cancel and get a refund within 30 days—no questions asked. So apart from monitoring your senior’s physician visits, it is useful to find out his exact location in case he isn’t home by the time he is expected. Or if he has wandered off, on account of his memory loss condition. The app can also be configured to send you alerts whenever it senses that the phone has gone outside the predetermined safe zone. It’s normal to worry about your loved one’s safety as you cannot be present with them 24/7. Fortunately, technology can be the way out for your troubles. Download the Senior Safety App today and enjoy the many benefits of GPS tracking for the elderly. With a senior GPS tracker, your parents can enjoy an independent lifestyle while having the security of getting immediate assistance when needed. Their physician visits will be well-monitored and they will thus keep better health. Senior Safety App is an effective senior monitoring device without the need for any additional hardware. Simply install on your Android phone and configure alerts.